And these Christmas Fundraising Ideas are sure to make full use of the fundraising potential of this splendid time of giving. After deciding on which fundraiser(s) is best suited for your cause or organization of course. Two very important steps in ensuring that you hold a successful fundraiser (click here to find out more). An item that will take some work to organize but it's a product that people WILL be buying before Christmas anyway. So... use your cause as a marketing angle to ensure people buy their trees through you and not someone else! You'll need to find a supplier and a location to sell from (potentially your organization headquarters). An exceptionally simple and obvious fundraising product for this time of the year. Everyone is wrapping gifts, so wrapping paper is an essential item that they will be buying anyway! It's the perfect fundraising product. Read how to use it successfully here. Many people find it a pain to have to wrap gifts (me included), so why not offer a gift wrapping service to your members, supporters and your community. Find some volunteers, see if you can get your wrapping paper sponsored and then promote your services thoroughly. Read here for more info on this idea! Another simple product that is in high demand during the festive season. You should look to sell them in combination with the Wrapping Paper to increase profits! Remember though that there is also much competition for these products, so you will need to promote this fundraiser effectively! Everyone loves a bit of sport and exercise... 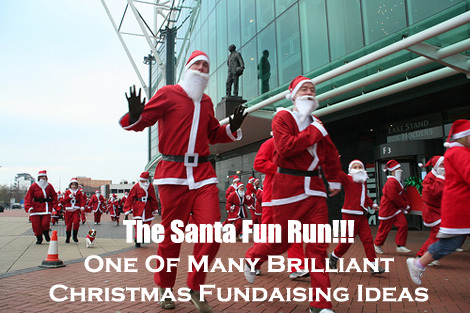 So why not have a Fun Run in the theme of Santa Clause. It's a fundraising idea that is extremely popular and widely used - so if there isn't one in your area, get it started. Remember to add as many additional Christmas fundraising ideas and methods to your event to make it as profitable and successful as possible. 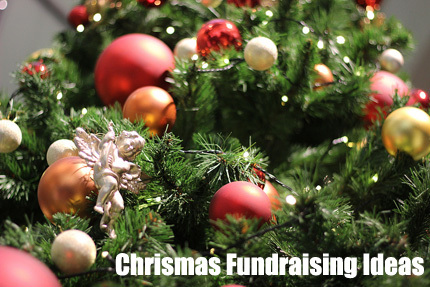 Hold a trivia fundraising event in the Christmas spirit. Use Christmas decorations, dress code, and focus your questions around the Xmas theme! It's a fantastic fundraiser and if you subscribe to my free newsletter you'll receive a copy of the Trivia Event Fundraising Guide. Obviously you will need to customize the advice in that guide for your Xmas theme. Karaoke events provide some fantastic fundraising potential and are always fun for your supporters. So, give them the opportunity to crack out some Xmas songs... Both modern and the good ole Carols! Fundraise through ticket sales (or karaoke singing purchases), food and drinks, raffles, and what about voting for the best singer... It's only a dollar a vote (for example)! For the right organizations that can put a Choir together, this can be a great fundraiser. Hire your Choir out for events, or sing in public places and take donations. An important thing is to actually have fun with this and to remember the Christmas spirit when doing it. You'll raise far more that way! An event that has so much potential; from bake sale items, to Xmas presents and other crafts, you can hold a fundraiser that brings in some great funds for your organization! You can also link some of the other ideas into it like selling Xmas Trees, Wrapping Paper, Decorations, and having a Gift Wrapping service at the fair, etc. More products that people will be buying during the Festive Season. Organize some volunteers to make Christmas Wreaths and then sell them with your Trees, or at Christmas Fairs, etc. You can also make decorations, or source them from somewhere, and sell them on as well. Which is why the promoting of your Christmas Fundraising Ideas is so important! We all know how great a simple Candle Fundraiser can be so why not sell Candles that are made with Christmas in mind. 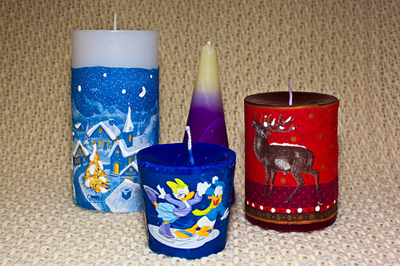 Check out these Candle Fundraising Ideas (including Xmas Candles). Many shops love to have their stores decorated in the Festive Season spirit, so why not offer a window painting and decorating service to these stores. You'll need creative/arty volunteers, paint, decorations and other tools for your trade (like ladders etc.). Back to a simple product that sells well during the Festive Season. Make sure that you customize the Advent Calendars to promote your organization but still keep the Christmas spirit! Once again the profitability of this fundraiser will come down to your profit margin on the product, plus how effectively you promote and sell the Calendars! For more unique fundraisers take a look here. Got any Christmas Fundraising Ideas you'd like to share?